New York regulators are preparing to implement a new set of rules for controlling wastewater pollution at large dairy farms under the federal Clean Water Act, acting after a judge sided with environmental groups in blocking an earlier rewrite of the rules. But while this legal process has been playing out, more than 200 dairy farms across the state have opted out of regulation under the Clean Water Act, which the state administers, and instead chosen to seek permits under an alternative state law. At issue are two sets of regulations under which the state issues permits certifying that farms handle animal wastes in ways that prevent contamination of local water supplies. The regulations cover farms classified as “concentrated animal feeding operations,” or CAFOs – a classification that in this region applies mainly to very large dairy farms, those that keep hundreds or even thousands of cows in freestall barns. When the state Department of Environmental Conservation first proposed a new set of CAFO regulations three years ago because of updates to the federal Clean Water Act, a coalition of environmental groups took the state to court, arguing that the state’s proposed new permit system violated the federal law it was supposed to uphold. In April, a state judge agreed with the groups on several points, including their claim that the regulations failed to give the public the ability to review individual farms’ manure management plans. The judge gave the DEC until September to rewrite the regulations, and a public comment period on the revisions ended last month. The new regulations are expected to take effect by the middle of 2019. In the meantime, however, about 90 percent of the farms that had CAFO permits under the federal Clean Water Act have opted to be regulated instead under state Environmental Conservation Law. CAFO permits issued under the state law actually require a tougher standard for manure containment at farms, but they do not require farms to file “nutrient management plans” with the state, as the federal permitting system does. Erin Doran, a senior attorney for Riverkeeper, one of the environmental groups that took the state to court, said her organization is pleased with the DEC’s latest revisions to the Clean Water Act permitting system. But she said environmentalists are worried that so many farms are seeking to be regulated under state law instead. “We do appreciate the changes to the permit,” Doran said. “We’re concerned that in response to changes to the permit, some facilities are seeking coverage under a different permit,” one that might not be correct for that farm. “We’d like to see the state require all facilities to switch to the same permit,” she said. Although CAFO regulations locally apply mainly to dairy farms, the rules cover any operation that shelters many animals in a confined area. The designation also includes large poultry or hog farms. Because the animals at large farms rarely leave their buildings, their waste accumulates inside. If it isn’t disposed of properly, it can run off into the landscape, potentially contaminating lakes, streams, rivers, and nearby wells with excessive nutrients and pathogens. 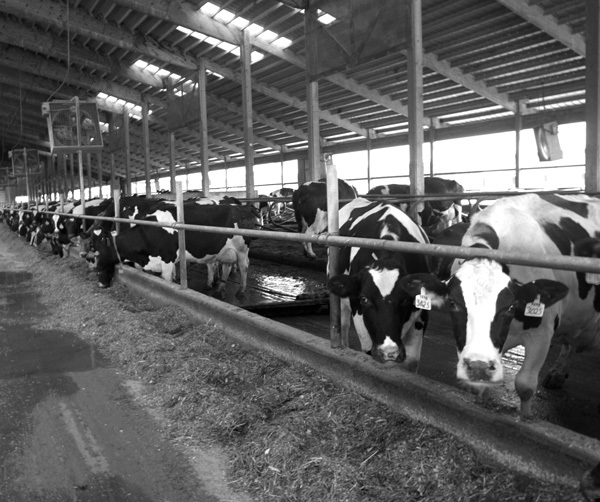 On dairy farms, the waste stream may also include bedding and wash water from the milk house. An undated map on the DEC Web site shows two medium and two large CAFOs in Saratoga County, 18 medium and three large in Washington County, five medium and one large in Rensselaer County, and 13 medium and two large in Columbia County. A medium-sized CAFO is defined as having between 200 and 699 adult cows. A large CAFO has 700 or more. Some very large dairy farms, mostly in western New York, each have more than 4,000 cows. Sarah Latessa, who writes CAFO permits for the DEC’s Division of Water, said the Saratoga Race Course also is classified as a CAFO because of the large number of horses stabled on the grounds before and during the racing season. Before a CAFO can start operating, it needs a permit to ensure its manure won’t escape and cause contamination. Farmers who need a CAFO permit may apply under either the federal Clean Water Act or the state Environmental Conservation Law. The federal permit requires farms to file a nutrient management plan with the state and allows for limited discharges of raw waste. The state law allows no discharge but also doesn’t require filing a nutrient management plan, although the farm has to keep one on site to show during DEC inspections. In New York, the DEC administers both the federal and state permits. For farmers, manure is a nutrient-rich material that can be returned to the fields to nourish the crops that will feed the cows. Manure reduces the need for commercial fertilizers that farmers would otherwise have to buy. “Our members never want to lose nutrients to the environment and are always improving their nutrient use efficiencies,” David Fisher, the president of the Farm Bureau of New York, wrote in comments to the DEC.
To meet the requirements for either permit, farmers work with a state-certified planner to draw up a comprehensive nutrient management plan. The plan includes information about the farm’s field crops – such as corn, hay or soybeans -- as well as how the farm will store and spread its manure. One cow can produce 120 pounds of semi-liquid waste a day, so big farms need a big holding area, called a lagoon, to contain it until conditions are right to spread it on the fields. The manure storage lagoon is the major component in a farm’s strategy to prevent waste runoff, Latessa said. Under the state’s permit, the lagoon must be deep enough to prevent overflow during a 100-year rainstorm. A federal permit only requires the lagoon to stand up to a 25-year storm. The exact height that a lagoon’s walls must extend above the surface of the waste depends on rainfall averages in the farm’s area, Latessa said. Other measures required by a permit may include installing berms, maintaining vegetation buffers between the lagoon and nearby streams and ponds, and actions farm staff may take before an expected storm to lower the lagoon’s level. “It’s very farm-specific,” Latessa said. When the state issued its first draft in December 2015 of new CAFO regulations under the Clean Water Act, among the proposed changes were that the state would no longer review farms’ nutrient management plans -- and that the full plans would not be available to the public. The state’s revisions drew criticism from the U.S. Environmental Protection Agency, which enforces the Clean Water Act, and state environmental groups concerned with water quality. In letters sent to the DEC in March 2016 and March 2017, the EPA warned that the DEC’s Clean Water Act permits didn’t meet federal requirements, which include public disclosure while a permit is in force. In May 2017, however, after the change in presidential administrations in Washington, the EPA dropped its objections without stating a reason. Two months before that, Riverkeeper, which is based in Ossining, joined with several other environmental organizations -- Waterkeeper Alliance, Cortland-Onondaga Federation of Kettle Lake Associations, Sierra Club, and Theodore Gordon Fly Fishers – to challenge the state’s new permit system in court, alleging Clean Water Act violations and other concerns. The environmental law firm EarthJustice handled the case. In a decision in April, Acting State Supreme Court Justice David Weinstein sided with the environmental groups on two of the three issues they raised. One of those issues involved the engineering consultants farmers hire to draw up nutrient management plans. The state was proposing to allow the consultants, who are state-certified, to verify that farms’ plans conformed with the law. But the judge held that because farmers were paying the consultants, these experts “have an inherent conflict of interest” in certifying that a plan complies with the Clean Water Act. “It simply does not comport with the federal regulatory requirement for state agency review and approval,” Weinstein wrote. He likened it to the state accepting tax returns without having its own auditors review them. The Farm Bureau had argued that the information in the comprehensive nutrient management plans ought to be treated as confidential business information protected under state law. Information about water sources, buildings, and “biosecurity related areas” was especially sensitive, the organization claimed. Weinstein gave the DEC until Sept. 7 to issue a revised Clean Water Act permit system for public comment, and the comment period closed last month. The state has until Feb. 7 to issue its final regulations for the permitting system. All of the state’s existing Clean Water Act permits will expire on July 8. Farms that want to keep those permits will have to obtain coverage through the new application system. But very few farms are still operating under the Clean Water Act permits. According to DEC figures, as of last year, 238 farms were covered by CAFO permits issued under the federal law, while 279 had permits under the state Environmental Conservation Law. But by last month, only 21 farms were still operating under the federal law, while 477 now have permits under the state law. Latessa said that because the state law actually has higher standards for manure containment, “it would be viewed as a success in New York if all farms” switched to regulation under ECL permits. Since 2011, the state has spent $80 million from its Environmental Protection Fund on agricultural nonpoint source abatement and control programs, which keep manure and farm fertilizers from running into streams, according to the DEC.
“The state has better defined what it meant in both permits,” Latessa said. “That made farmers more comfortable” about what they’d have to do to meet the permits’ requirements, she added. Manure spreading practices, which are not covered by either permit, remain a point of contention. Manure applied to frozen or saturated ground may run off into waterways instead of sinking into the soil. The Farm Bureau wants to retain maximum flexibility for farmers, who may have to change plans quickly to take advantage of weather conditions. Farmers are having to adapt to a “new normal” of wetter winters, more extreme storms, and unpredictable weather, Fisher wrote. Riverkeeper, on the other hand, would like to see more state regulation of winter manure spreading to protect nearby homes and streams, Doran said. “The restrictions are being applied to a narrow set of circumstances, when a threat could still exist outside them,” she said. Broader restrictions would offer more protection to watersheds, she said. Overall, however, Riverkeeper was satisfied with the changes forced by the court’s ruling.